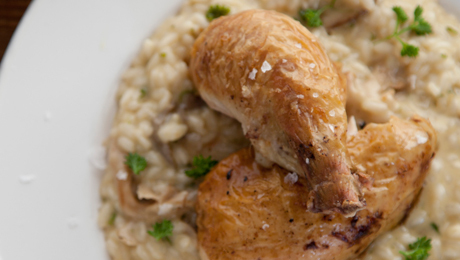 This simple recipe is a risotto myth-buster, as you'll end up with perfect risotto that's not at all gluey. It's a great dish to make over a short period of time, very nutritious and filling too. Bring the stock just to the boil in a large saucepan. Reduce the heat and hold at a gentle simmer. In a separate wide saucepan with a thick base, slowly heat 40g of the butter and 40ml of the oil on a low heat. Add the chopped shallots and thyme. Cook very gently for about 60 seconds, until completely softened. Add the rice and coat with the butter, ensuring it does not stick to the base of the pan. Cook the rice for 1 minute, until it becomes glazed. Add the white wine and continue to slowly stir the rice. The wine will evaporate quite quickly now, so over a low heat, add some chicken stock to the rice one ladle at a time, never adding the next ladle until the previous one has been absorbed. It is vitally important not to rush this process. Continue to add all of the liquid until the rice is plump and tender, which will take 18 to 22 minutes. Drizzle the remaining oil in another pan, add the mushrooms and cook for 2 minutes on a high heat until cooked through. Season with salt and pepper and remove from the heat. Kitchen Tip: Using a highly flavoured, good quality chicken stock will really benefit this dish.